Struncheon Hill in Brandesburton, near Bridlington, Yorkshire sleeps 20 people. Struncheon Hill near Bridlington is the perfect choice for get-togethers of large families or groups of friends. It is peacefully situated on a small holiday cottage complex, which is surrounded by paddocks and woodland, with a wide variety of wildlife to be seen. The detached accommodation is spacious with an impressive first floor, with an open plan living area with bi-folding doors leading out to a balcony overlooking the countryside. 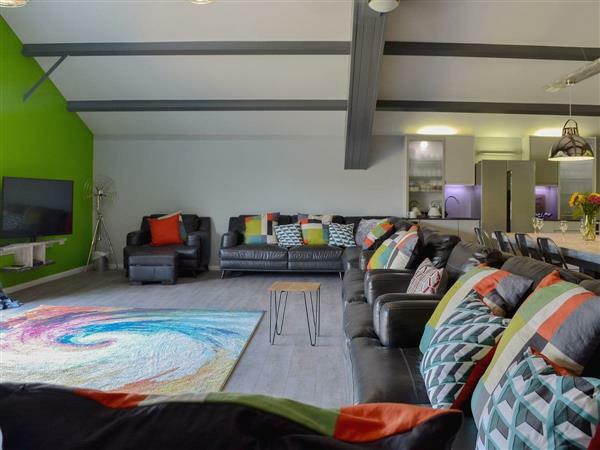 A contemporary, well-equipped kitchen has been carefully planned for catering for large numbers, and a small kitchen area on the ground floor, close to the bedrooms, has a coffee machine, tea making facilities and a fridge. The bedrooms are located on the ground floor and all boast en-suite facilities. Struncheon Hill enjoys its own private hot tub and also access to shared on-site facilities, including an indoor swimming pool, games room and children’s play area. The property enjoys a private, enclosed, lawned garden and a shared 2-acre paddock for exercising dogs, whilst 10 acres of unspoilt shared grounds are ideal for picnics. Oaklands wedding venue is situated in the 150 acres of woodland that surround the complex. Brandesburton village, 4 miles, offers a general store, fish and chip shop, pizzeria and choice of pubs. Hainsworth Park Golf Club welcomes visitors for pay as you go golf, and close by there are facilities for fishing, clay shooting and jet skiing. Just a short drive leads to the coastal resorts of Hornsea, Bridlington and Filey, with miles of sandy beaches, colourful promenades, inns and tearooms in abundance. Bird lovers can enjoy a visit to Hornsea Mere and RSPB Bempton, and the charming market town of Beverley is not to be missed with its 13th-century minster and renowned racecourse. Interesting days out can be spent exploring the stately homes and halls at Burton Constable, Sewerby, Burton Agnes and Sledmere. Walking and cycling tracks surround Struncheon Hill, and there is easy access to the scenic Yorkshire Wolds which inspired the famous Hockney paintings. The beach is 16 miles from Struncheon Hill near Bridlington. With the shop, pub and restaurant 4 miles from Struncheon Hill. Kitchenette: With fridge and coffee machine. Bedroom 1: With king-size bed, Smart TV and en-suite with shower over bath, and toilet. Bedroom 2: With king-size bed, Smart TV and en-suite with shower over bath, and toilet. Bedroom 3: With king-size bed, Smart TV, patio doors leading to sitting-out area, and en-suite with shower cubicle and toilet. Bedroom 4: With king-size bed, Smart TV and en-suite with shower cubicle and toilet. Bedroom 5: With king-size bed, Smart TV and en-suite with shower cubicle and toilet. Bedroom 6: With king-size bed, single bed, Smart TV and en-suite with shower cubicle and toilet. Bedroom 7: With king-size bed, single bed, Smart TV, patio doors leading to sitting-out area, and en-suite with shower cubicle and toilet. Bedroom 8: With twin beds, Smart TV, patio doors leading to sitting-out area, and en-suite with shower cubicle and toilet. Bedroom 9: With twin beds, Smart TV, patio doors leading to sitting-out area, and en-suite with shower cubicle and toilet. Living room: With Smart TV, DVD player, CD player, beams, wooden floor and bi-folding doors leading to balcony. Kitchen/dining room: With 4 electric ovens, 2 electric hobs, 2 fridge/freezers, 2 dishwashers, beams and wooden floor. Biomass heating, electricity, bed linen and towels included. Travel cot and highchair available on request. External games room with pool table, darts and selection of games (shared with other cottages). Enclosed lawned garden with sitting-out area and garden furniture. Balcony. 10-acre grounds (shared with other cottages). 2-acre paddock (shared with other cottages). 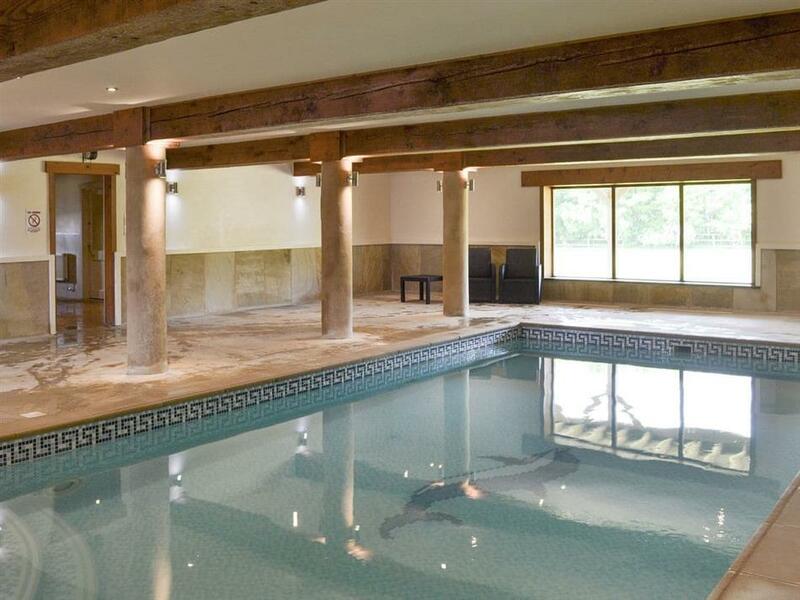 Indoor swimming pool (shared, 32ft 10in x 16ft 6in, depth 3ft 11in). Hot tub for 8 (private). Private parking for 6 cars. No smoking. Please note: The property has a natural water supply from a borehole. Holidays at Struncheon Hill run from Friday to Friday. Pets allowed at Struncheon Hill. For a better idea of where Struncheon Hill is, you can see Struncheon Hill on the map below. Struncheon Hill is in North Humberside; should you be on the lookout for a special offer, you can find all the special offers in North Humberside. It's always worth checking to see what is on offer at the moment. Do you want to holiday near Struncheon Hill (UKC2652), you can see other cottages within 25 miles of Struncheon Hill; have a look to find your perfect holiday location.